This meal is delicious on so many levels. It tastes so gourmet, but is actually so manageable to make. The thing I love about it most is that you can serve this dish right out of the pan. Buy some thick crusty bread and everyone can dip directly in the pan to make sure and get every tasty bit. The salad has a fantastic vinegar bite, it goes perfect with the Shrimp & Feta. Both are recipes inspired by Ina Garten, one of my top favorite chefs. -Preheat oven to 350 degrees. Place the artichoke hearts in a bowl with 1/4 cup olive oil, 1/2 tspn. salt and 1/2 tspn. pepper. Toss until they are well coated. Put artichoke hearts on to a sheet pan and spread out. Roast in the oven for 20 minutes. -Make the vinaigrette while the artichokes are roasting. Place the shallot, lemon juice, mustard, 1 Tbl. vinegar, 1/2 tspn. salt and 1/2 tspn. pepper in a bowl of a food processor. With a blade attachment, process for 5 seconds. Add basil leaves and process until green puree. With the processor running slowly, pour 1/2 cup olive oil into the bowl. Set aside. 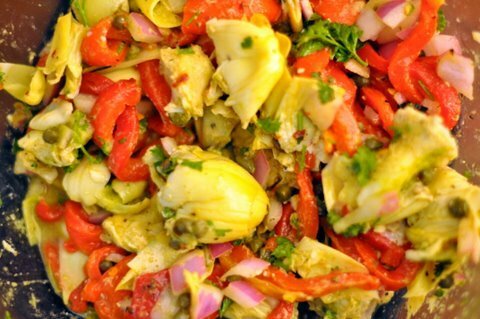 -Place the artichoke hearts in a bowl and toss with enough vinaigrette to moisten. Add capers, red peppers, red onion, parsley, 4 Tbl. vinegar and red pepper flakes. Let flavors blend for 30 minutes and taste for salt & pepper. Serve at room temperature. -Preheat oven to 400 degrees. Heat 2 Tbl. of the olive oil in a 10 or 12in heavy skillet over medium low heat. Add the fennel and saute for 8-10 minutes, until the fennel is tender. Add the garlic and cook for 1 minute. Add the wine and bring the pan to a boil, scraping up any of the browned bits. Cook for 2 minutes until the liquid is reduced by half. Add the tomatoes, tomato paste, oregano, red pepper flakes, Pernod (don’t skip this ingredient…I know you might not have it…but splurge on a bottle, you will use it again) salt and pepper. Simmer over medium-low heat, stirring occasionally for 15 minutes. 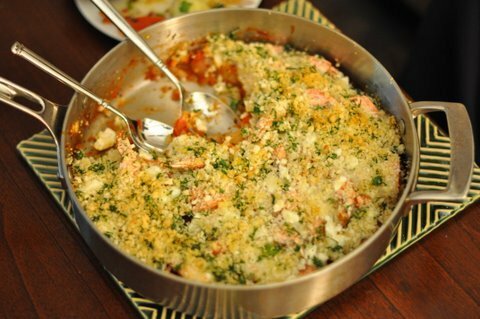 -Arrange the shrimp, tails up, in one layer over the tomato-mixture in the skillet. Scatter the feta evenly over the shrimp. 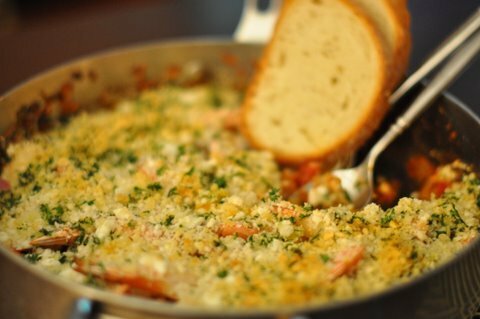 -In a small bowl, combine the panko, parsley, and lemon zest with the remaining 2 Tbl. of olive oil and sprinkle over the shrimp. Bake for 15 minutes until the shrimp are cooked and the panko/feta is golden brown. Squeeze the juice of 1 lemon over the shrimp. Serve hot from the pan. Enjoy! 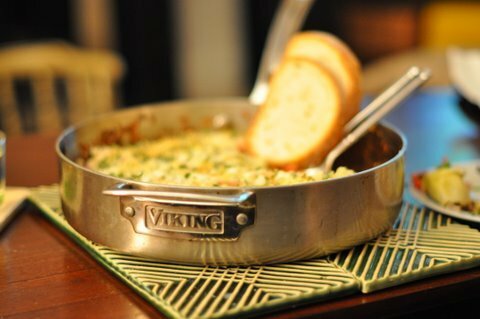 **If you are looking for new pans, trust me when I say that I am in love with our Viking pans. They cook so evenly and are easy to clean. I couldn’t be happier with them!